What is it about Marilyn Monroe? It wasn’t just her looks. She was America’s sweetheart, “The Blonde Bombshell.” She was everything men wanted and everything women wanted to be—curvy, charming, and maybe a bit wild. Her memory lives on and on, generation to generation, yet I’m not sure we can even call her a gifted actress. Put it this way: she was no Vivien Leigh or Elizabeth Taylor. However, Marilyn—little Norma Jeane Mortenson—is possibly the most recognized actress in history. Last year, My Week with Marilyn was released with a new take on this goddess of film. Based on the detailed journal of Brit Colin Clark (who worked as a gofer on the 1957 film The Prince and the Showgirl), the movie garnered Michelle Williams an Oscar nomination and a Golden Globe win for portraying the ageless diva. It is a film not to be missed, if only for Williams’ performance. Uptight Sir Laurence Olivier is making a movie in London. Colin Clark finagles himself a job on the set. When Monroe arrives for the start of shooting, all of London is excited to see the blonde bombshell, while Olivier struggles to meet her many demands and acting ineptness. Basically, Monroe is a mess, addicted to her alcohol and pills. Young Colin’s can’t help but be infatuated with her, however, and soon, she invites him into her inner world where she struggles with her fame, her beauty, and her desire to be a great actress. 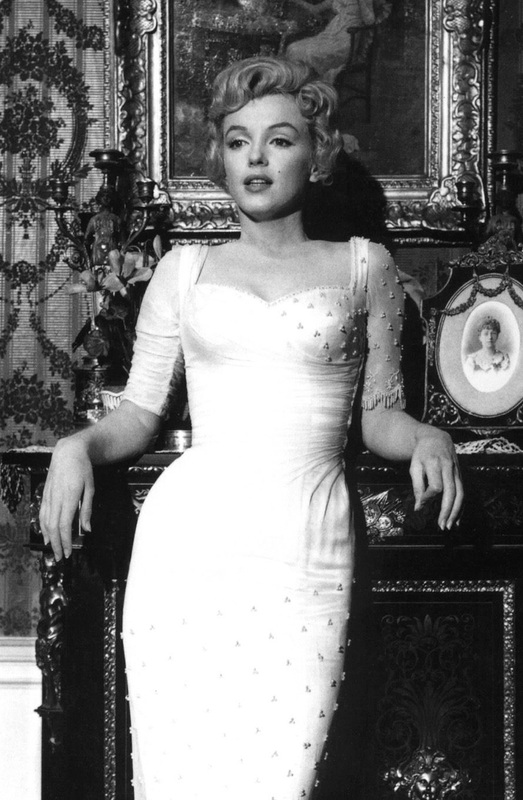 The real Marilyn, on the set of The Prince and the Showgirl, 1957. As I said, this film is based on a true story, documented in Colin Clark’s book, The Prince, the Showgirl, and Me: Six Months on the Set With Marilyn and Olivier. 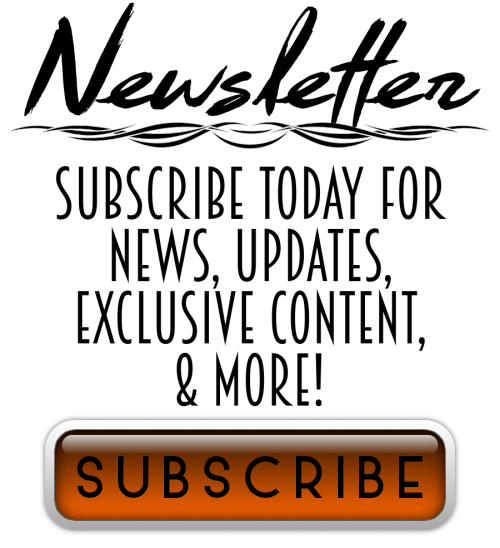 Internet Movie Database—the best movie reference site in the world—backs up Clark’s story. According to IMDB, Olivier was driven so mad by Monroe’s difficult behavior that he practically abandoned directing. Also at the time of filming, Monroe suffered from various illnesses and a miscarriage. No wonder the woman was a mess! But what a beautiful mess. The transformation of Michelle Williams is incredible. It’s easy to believe she really is Marilyn Monroe. She embodies the classic actress’s movements, voice, and look flawlessly. 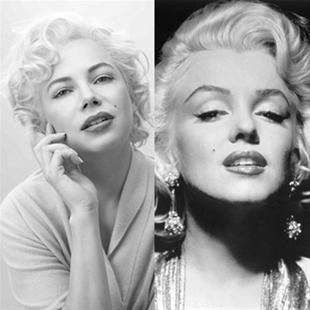 She also embodies Monroe’s pain in a fashion that is truly Oscar-worthy. Kenneth Branagh plays a pitch perfect Olivier (he even kind of looks like the guy! ), while young actor Eddie Redmayne is wonderfully believable as the love-struck Colin Clark. My Week with Marilyn made me think a lot about Ms. Monroe. I do not believe she was a happy person, if Williams’ portrayal is anything close to fact. She was so beautiful and so adored, but she was constantly afraid of being left alone—just like when her father abandoned her as a child and her mother left her for the insane asylum. Monroe is something of a tragic hero, a drug addict who probably suffered from deep, deep depression. It’s sad to think of her dying so young, at the mere age of thirty-six, all alone, after having taken too many pills. I wish she could have found lasting happiness, like so many of the characters in her films. Will the real Marilyn please stand up?? 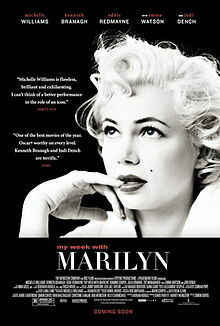 Although Marilyn Monroe’s life ended in tragedy, the film My Week with Marilyn is not tragic at all. It is more focused on Colin Clark’s devotion to the starlet, the first real love of his life. The snippet of Monroe’s life portrayed in this picture is a troubled time during her short and tumultuous marriage to playwright Arthur Miller. However, we know (thanks to IMDB) that she went on to act in my favorite of her films, Some Like It Hot, right after. We know she continued to be America’s sweetheart, and it’s safe to say she still is, even today. Marilyn Monroe lives on through her films and through films like this one. My Week with Marilyn is an honest, painful glimpse into the life of a distressed, beautiful young woman and the thousands who loved her then, and let’s face it—still love her today. What I find interesting is that her sadness, her need to be loved, is probably what shot her staright to stardom. She had a “quality” (cliche, I know) that made men want to sweep her up and take care of her: but instead of being an act, it was real, so no man ever really could “fix” her. This is also why she was universally loved by women. Because of that subtle sadness and vulnerability, I don’t think she was ever hated by the general female public, but embraced. If you look (and by look, I mean study) photographs of her, from young, to her very last photo shoot, she never looks really, genuinely happy. She always has this sad note on her face. This inner turmoil is what made her so dynamic, so appealing, so legendary. And while she is one of my all-time favorite people, and her death was tragic because she was alone and young, there is something poetic about the fact that we never have to watch Marilyn Monroe get old. (To quote Steel Magnolias) She will always be young, she will always be beautiful. And I personally, do not wish to think of her any other way. As a fan, I loved this movie (saw it in the theater). I don’t know if everyone would love it, but it is a spectacular slice of Hollywood, and Marilyn. For those of us who long for the “glory days of Hollywood” and are intrigued by Ms. Monroe, and want to know more about her, I think this film gives us exactly what we want. She will always be young and beautiful, won’t she? I knew you would love this movie, darling girl. Thank you for your comments. You’re so right!